The first two factors require a bit more explanation. Why would a huge financial institution like AIG take on $100+ billion in risk without understanding, or particularly caring about, material terms of the deals? You have to understand the players in the ABS CDS market at the time, and how AIGFP viewed itself in the market. The natural protection sellers for CDS on ABS or CDOs were the monoline insurers (MBIA, Ambac, etc. ), since "wrapping" deals is what they do. The market had been trying to develop standardized documentation for ABS CDS for a while, and the monolines had been notoriously difficult to work with. The market never did settle on a single template for ABS CDS, and that was primarly because of the monolines. Instead, the market settled on two forms: the so-called "dealer form" and the "end user form." Ironically, the monolines were adamantly opposed to this because — I kid you not — they said they didn't want to be exposed to market risk. AIG's hands-off attitude meant that it had no line-of-sight to the mortgage market, or to the mortgages underlying their deals. So when the lending standards in the subprime market plummeted, AIG was the last to find out. In the end, though, it was the terms of the Credit Support Annexes (CSAs) on the CDS trades that really killed them, because they left AIG massively exposed to market risk. CSAs govern the passing of collateral between counterparties to a swap transaction. Standard CSAs provide the parties with the right to demand collateral whenever the party's "Exposure" — defined as the cost of replacing the trade in the market — exceeds a certain threshold. The CSAs on AIG's trades required them to post collateral based on the market value of the underlying cash bonds (i.e., the subprime RMBS), and included moderate thresholds in the 5-10% range, if they included a threshold at all. This meant that as the ABS and CDO markets collapsed and liquidity dried up, AIG had to post more and more collateral — even if, as was sometimes the case, the underlying ABS had yet to suffer any principal or interest shortfalls. I know the mistakes that AIG made on the collateral posting probably seem like highly technical mistakes, but believe me, they're not — they're serious, fundamental mistakes that no moderately sophisticated investment shop should ever make. [W]hat is ... striking is that a well-respected Fitch survey before the collapse of the credit bubble suggested that AIG was just the 20th largest credit default swap player in the sector, based on gross notional outstanding volumes. No wonder those billions of lossmaking contracts subsequently came as such a shock. Global Insurance The global insurance/reinsurance sector, representing principally AIG Financial Products, remained a large seller of protection, registering an aggregate gross sold position of USD503bn. On a net basis, the sector stood at USD395bn sold, up slightly from the USD383bn tallied at year-end 2005. Structured finance synthetic CDOs and corporate synthetic CDOs accounted for 93% of the sold volume. In terms of quality, of the total gross amount sold, 93% was in the super-‘AAA’ segment, versus 91% reported in last year’s survey. In addition, 68% of the tenor sold ranged from one year to four years (compared with 44% at year-end 2005) though that was driven by AIG’s dominant “footprint” in this market. 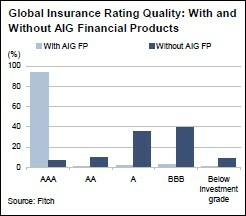 Excluding AIG Financial Products’ sizeable position, the global insurance industry had a net position of only USD11bn (USD21bn gross sold), down from the USD15bn (USD29bn gross sold) compiled at year-end 2005. Some of the decline can be attributed to a smaller sample than in the previous year. By product on a sold basis, single-name CDS consisted of 63% of the volume, while corporate synthetic CDOs and structured finance synthetic CDOs made up just 16% of the total. Similarly, the credit profile, excluding AIG, of the industry changed, with ‘BBB’ representing 40%, ‘A’ at 35%, and ‘AA’ at 10%, while speculative grade represented 8%, and ‘AAA’ 6% of the notional amount sold. The Fitch survey—which is publicly available (with a free Fitch account)—was published in July 2007, and was very well known in the markets. If you're a financial journalist covering the credit derivatives market, there's no excuse for not knowing about AIGFP until September 2008. The non-financial sectors of our economy will not suffer much from even a prolonged banking crisis, because the general economic importance of banks has been highly exaggerated. ... Although banks perform an essential economic function — bringing together investors and savers — they are not the only institutions that can do this. Pension funds, university endowments, venture capitalists and corporations all bring money to new investment projects without banks playing any essential role. [ed: Wow. Just wow. I didn't think it was possible to be a professional economist and also not understand a single thing about how a financial market works. Apparently I was wrong.] What’s more, it’s not as if banking services are about to vanish. When a bank or a group of banks go under, the economywide demand for their services creates a strong profit motive for new banks to enter the marketplace and for existing banks to expand their operations. (Bank of America and J. P. Morgan Chase are already doing this.) ... And if it takes a while for banks and lenders to get up and running again, what’s the big deal? Saving and investment are themselves not essential to the economy in the short term. Businesses could postpone their investments for a few quarters with a fairly small effect on Americans’ living standards. How harmful would it be to wait nine more months for a new car or an addition to your house? During the heady days of summer 1927, the Fed had done something else that would contribute to the Great Depression: It lowered interest rates. The "heady days of summer 1927"? The U.S. was in a recession in the summer of 1927. I guess if the facts don't fit your conspiracy theory, you just change the facts. He also manages to describe the LTCM crisis without ever even mentioning that a consortium of fourteen Wall Street banks bailed out LTCM to the tune of $3.625 billion. (Johnson conveniently omits any reference to this massive debt-for-equity swap, even though he's previously argued that, with debt-for-equity swaps, "the problem of moral hazard . . . would at once be forgotten.") Instead, he focuses on the moral hazard created by the Fed's decision to cut rates 50bps in the weeks following the LTCM crisis. I kid you not. These two examples are just the tip of the iceberg. TNR's editors should be thoroughly embarrassed. As demonstrated by Donald Barlett and James Steele of Vanity Fair. They devote 6,500 words to the (shocking!) revelation that no one knows exactly what each bank did with its TARP money, because Treasury hasn't been "tracing" TARP funds. Apparently no one pulled Barlett and Steele aside and explained to them that money is fungible—once TARP money is credited to a bank's Federal Reserve account, it becomes indistinguishable from the rest of the money the bank has in that account. When you take $20 out of the ATM, do you know exactly which of your deposits the $20 came from? No, because money is fungible. Treasury could have asked the banks what they did that, without TARP, they would not have, but since there's no way to verify a bank's claim, all the banks would've claimed that they spent their TARP money on apple pie and American flags. So after 6,500 words, the basic conclusion is: Treasury injected a lot of money into a lot of banks, and a handful of those banks have business practices that, while not against the law, you may find unsavory. At the end of my initial post on financial innovation, I listed a handful of financial innovations that I considered beneficial. (I didn't mean to list both zero-coupon bonds and Treasury STRIPS, since STRIPS are obviously zeros—the most important zeros, in fact.) I was mainly focusing on financial products that no one has yet mentioned as being beneficial in the financial innovation debate, which is why I omitted obvious examples like ETFs. Anyway, here, at last, is my argument for why medium-term notes and zero-coupon bonds are clearly beneficial financial innovations. (Next up: project finance and puttable bonds.) Medium-Term Notes A medium-term note (MTN) is a debt security offered to investors continuously over a period of time as part of an MTN program. Essentially, a company establishes an MTN program by filing a so-called "shelf registration" with the SEC describing, broadly, the types and total amount of securities they reasonably expect to sell under the program in the next two years. (Rule 415 covers shelf registrations.) After the SEC declares the shelf registration effective, the company can sell a wide variety of securities under their shelf-registered MTN program for the next two years on a moment's notice, and without having to file separate registration statements for each debt issue. Unlike conventional corporate bonds, which are underwritten, MTNs are generally distributed on an agency basis, with 3 or 4 investment banks acting as agents for each MTN program. An issuer will post offering rates with its agents for a range of different maturities: 9 months to 1 year, more than 1 year to 18 months, more than 18 months to 2 years, and so on up to any number of years. Issuers can change their offering rates in response to, say, a lack of investor interest, or a change in interest rates. An investor interested in purchasing notes at the offered rate will contact the issuer's agent, who then arranges the transaction. Investors are generally allowed to choose the exact maturity date within a given maturity range, which allows them to more precisely match the maturities of their assets and liabilities. (This is obviously an (extremely) abridged description of MTNs. For people who want a more complete description, I've extracted the chapter on MTNs in Marcia Stigum's Money Markets—mainly because I've just discovered how to extract sections from PDF files, and now I'm an extracting machine! For an example of an active MTN program, see here, or see Freddie Mac's MTN program here.) The main reason I immediately thought of MTNs as a beneficial financial innovation—though there are better reasons, described below—is a process in the MTN market called "reverse inquiry." Say a mutual fund needs $6.5 million of A3-rated paper with a maturity of 4 years and 6 months, but no such paper is currently available in the MTN market. The mutual fund could contact one of the major MTN agents, who would then go to the A3-rated issuers it represents with the mutual fund's proposed terms. If an issuer is satisfied with the proposed terms, a deal can be struck and the issuer can sell the custom-tailored security out of its MTN program that day. (The issuer is essentially taking the securities it registered with the shelf registration statement "off the shelf.") Reverse inquiries are actually quite common, and they account for a large share of total MTN transactions. The most exotic MTNs usually result from reverse inquiries—a fund manager may be exposed to some weird risk which necessitates paper that's linked to a random equity index or exchange rate or something. But this isn't a case of investment banks dreaming up exotic (and risky) securities and selling them to unsuspecting investors. Exotic MTNs that result from reverse inquiries are, by definition, driven by the needs of investors. More broadly, MTNs bridged the gap between commercial paper and traditional corporate bonds. For regulatory reasons, commercial paper can't have a maturity at issue of more than 9 months. That meant that prior to MTNs, any company that wanted to issue debt with a maturity of over 9 months had to register each debt issue separately, which was—and still is—both expensive and time-consuming. One of the reasons that traditional corporate bonds trade in such size ($100 million is an unofficial minimum) is that the legal, accounting, and printing costs of registration are so high. This is on top of the generous underwriting fee that seasoned issuers (the biggest beneficiaries of MTNs) paid to their "usual" investment bank. These costs made it prohibitively expensive to sell smaller and shorter-dated securities (i.e., maturities of 9 months to 2 years). This minimum-offering-size issue, as well as other conventions in the corporate bond market, such as the clustering of maturities around 2, 3, 5, 7, and 10 years, really limited issuers' options, and ultimately raised their borrowing costs. MTNs changed all that, making it cost-effective for companies to sell smaller debt issues at non-standard maturities, and often with terms that better suit both the issuer's and the investor's specific needs. MTNs also increased competition among underwriters by allowing issuers to engage multiple investment banks as agents for their MTN programs. The increased competition significantly reduced investment banks' fees, lowering issuers' borrowing costs even further. (The notion that increased competition can lead to lower underwriting fees seems almost quaint nowadays, but it was not always so.) That, to me, is a beneficial financial innovation. Zeros (and STRIPS) Zero-coupon bonds (known as "zeros") are bonds that pay no interest, but instead promise a single payment at maturity. Since investors receive no coupon payments over the life of the bond, zeros are sold at a discount to their face value. Any conventional couponed bond can be considered a series of zero-coupon bonds—each coupon is simply a promise to make a single payment on a specified date. Consequently, a conventional 5-year note can be "stripped" into its 10 coupon payments and a principal repayment, creating 11 separate zero-coupon bonds. Merrill created zeros in 1982, when it stripped a series of Treasury long bonds. Other investment banks quickly started selling privately stripped Treasury zeros as well. The Treasury Department finally started allowing direct stripping of Treasuries in 1985, when it instituted its STRIPS (Separate Trading of Registered Interest and Principal Securities) program. Treasury zeros, which are commonly referred to as STRIPS, are created via the Fed's book-entry system—when a Treasury is stripped, each coupon payment and the principal payment becomes a separate zero-coupon bond with its own CUSIP. Stripped Treasuries can also be reconstituted via the book-entry system. So how have zeros been beneficial? They eliminate reinvestment risk, which has made them perfect for pension funds and insurance companies, which need long duration and certainty in their returns. STRIPS, in particular, offer maximum certainty: the U.S. Treasury is the safest borrower in the world, and, as zero-coupon bonds, STRIPS also eliminate reinvestment risk. The certainty and long duration of STRIPS have been absolutely crucial to the ability of pension funds and insurance companies to reliably and predictably match the cash flows of their assets to the benefits payments they make. Zeros are more sensitive to changes in interest rates than conventional couponed bonds, which can lead to short-term volatility in prices, but that generally hasn't been an issue for long-term, buy-and-hold investors like pension funds. Also, zeros prices are something of a theoretical building-block in modern financial models. The large and liquid market in STRIPS, for instance, has provided accurate prices across a range of maturities, which is actually pretty important, especially for banks and other investment funds who rely on things like the zero-coupon Treasury yield curve in their pricing models. (In fact, the question of why it took the financial industry so long to create a product as fundamental and seemingly obvious as zero-coupon bonds is still something of a mystery in finance circles.) This isn't the most important benefit of zeros, to be sure. But it's not insignificant either, and I think we can all agree at this point that better financial models are a good thing. The markets, having tasted skepticism, are beginning to overdose. The bust likes to think of itself as a radical departure from the boom, but it has in common with it one big thing: a mob mentality. When the markets were rising and everyone was getting rich, it was rare to hear a word against the system—or the people making lots of money from it. Now that the markets are falling and everyone is feeling poor, or, at any rate, less rich, it is rare to hear a word on behalf of either the system or the rich. The same herd instinct that fueled the boom fuels the bust. And the bust has created market distortions as bizarre—and maybe more harmful—as anything associated with the boom. CDSs were also a terrible innovation, because they allowed a lot of investment firms to skirt regulatory regimes. Basel II had certain requirements about how much debt you could take on, and the CDS was almost engineered to be able to sneak around that regulation. [E]fficiency didn't really improve, as is evidenced by the enormous profits that the financial sector made. If they were getting more efficient, you would expect them to be making less money; in fact, they made more. This is wrong on multiple levels. On a theoretical level, Salmon is confusing the industrial efficiency of the financial services sector with the informational efficiency of asset markets. Industrial efficiency is concerned with whether the services provided by financial institutions are priced at their marginal cost. Informational efficiency is concerned with whether asset prices fully reflect available information (which is what people commonly mean when they discuss financial market efficiency). While industrial and informational efficiency are obviously related, they are by no means the same thing, and the "enormous profits" in the financial sector say very little about the informational efficiency of asset markets. Salmon's argument also presumes, wrongly, that the financial sector has earned consistently high profits for the same activities. The hugely profitable activities in finance are different practically every year. Traders and salesmen in that year's new, "hot" market pull down seven-figure bonuses, but then every other bank on the Street piles into that market, pushing down margins to more normal levels, and two years later traders in that market are applying for jobs on the muni bond desk. In the early '80s it was mortgage trading desks, then it was LBOs and junk bonds, then it was interest rate swaps, then it was anything calling itself a "hedge fund," then it was internet IPOs, etc., etc. The fact that new, different groups within the financial sector made outsized profits each year doesn't show, or really even suggest, that informational efficiency in the asset markets has failed to improve. Okay, in the next post (which I've already written) I'll discuss some of the specific financial innovations I highlighted last time. This post is getting way too long though, so I'm splitting it into two posts.